I never thought about writing a blog long-term when I started this two and a half years ago. On occasion I think I may throw in the towel and give it up because I’m not sure I have anything relevant left to say. I’m also not writing about what I really want to talk about and that is my search for wholeness, even more than health. I think health will follow. And so it seems I’ve run out of creative titles as well. I’m trying to figure out what direction to go with this because I really don’t want to give up the wonderful connections I’ve made online. 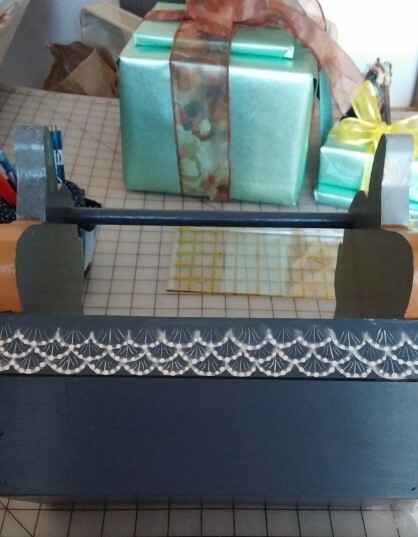 How do you title a blog that says “I’ve been busier than a one-armed paper hanger?” For someone with limited energy, I’ve tried to get a fair amount accomplished. 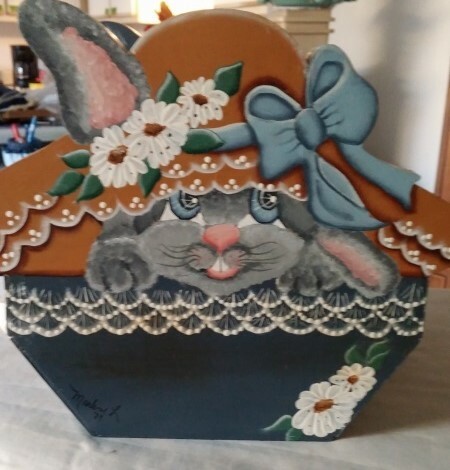 I dug out boxes of craft supplies as you saw last time and I found my old friend here. I painted this sweet lady 25 years ago. 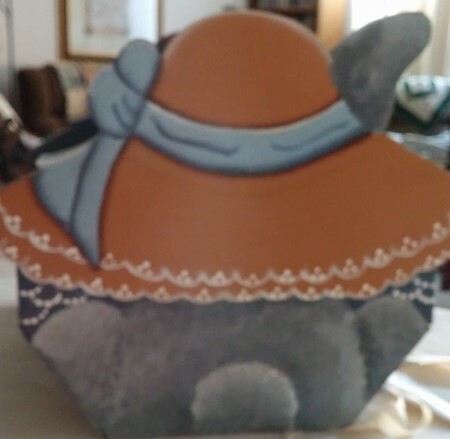 Since I have no little ones to indulge on Easter, I filled her full of chocolates and took her to my quilt group, and both writing groups last week. Daisy enjoyed the outing and being passed from one person to another. I had two machine embroidery classes in one month due to schedule changes by the instructor. So here are the completed projects. The apron was the most challenging for me as it was made from a man’s shirt and if you have them handy it’s a good upcycling project. I had to go to the thrift store for this. No men in my house. The other was not something I think I will make again. 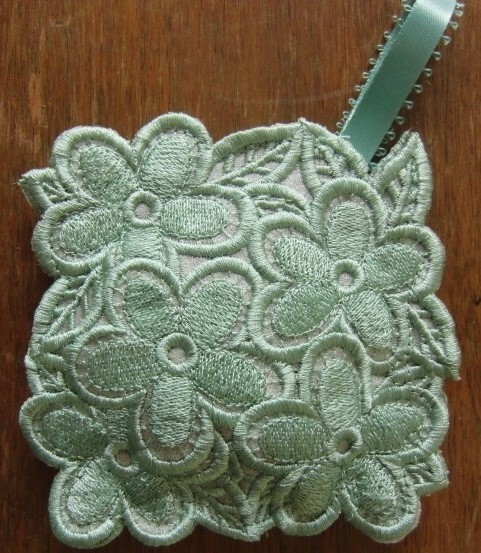 It’s pretty for a lavender sachet but I think it will be harder to replace the lavender when it loses potency. Both sides are exactly alike but the design is flipped to do the back and stitched on organza to contain the lavender. 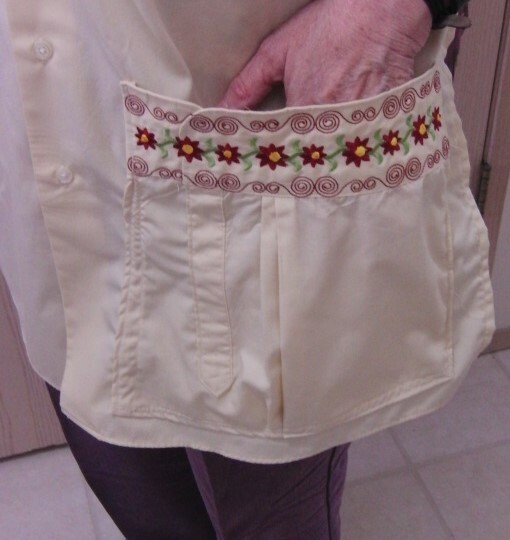 Pocket was from the sleeve and cuff. 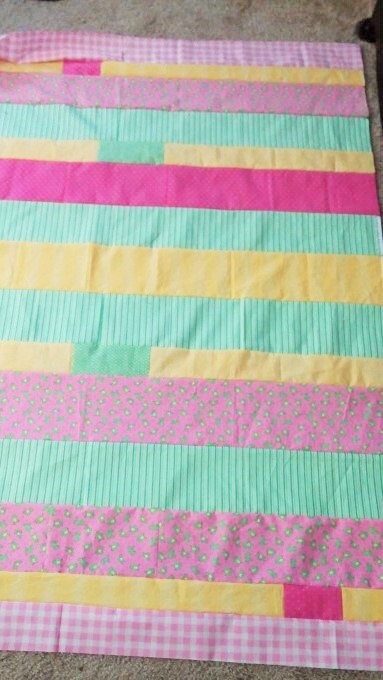 I finished a couple of strip quilt tops for our group and have almost finished sewing the binding on another. Easter was quiet here. I don’t pick the fabric, just sew it together. My daughter wanted to take me to breakfast so we got up and out early to beat the after church crowd and then did our grocery shopping for the week before spending a few lovely minutes in the bookstore. 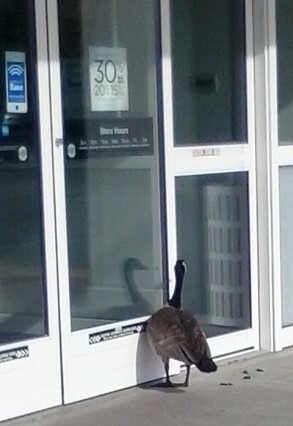 Everything else was closed to the dismay of many, including this confused goose. 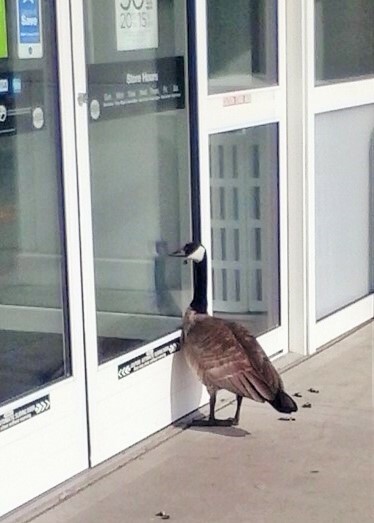 Goose was standing looking in the door at Kohl’s for over 10 minutes. I guess Goose was looking for a sale. My daughter walked within a few feet of him/her without being charged. We had a quiet evening at home where I cooked on the grill and she did her weeks laundry. Real exciting stuff. Open up. I came for the Easter sale. What’s next? 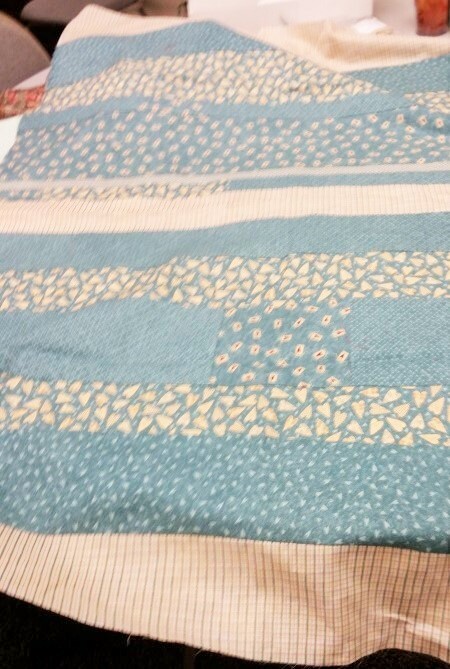 I have several quilts to finish and more organizing to do. I found a several small projects to do by hand with ribbon embroidery. A nice walk in the sunshine brought a writing assignment into clarity so I stopped for a glass of tea at the market and jotted it in the notebook that is always with me. Maybe next time I’ll get clarity on titles. Are you clear on your direction or do you meander around looking for the best path to follow? Have you noticed my posts getting farther and farther apart? I’ve been feeling quite badly about it but can’t afford to stress even a little. I mentioned a few posts back that I had taken on a bit more these days than previously. As the winter weather let go its icy grip, signs of life showed up in my apartment in a big way. Note at mailboxes said “Can’t get myself down the stairs but the first one than can will get to take me home from #2048.” It worked. My daughter helped me pull out several large boxes of craft materials from the far reaches of my garage. 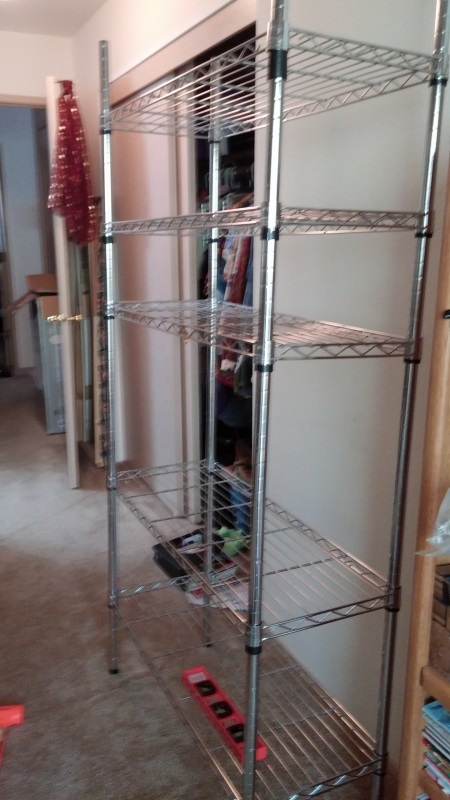 I rent a garage to store things so as not to be too cluttered up here. Riiight! One of the boxes was from a new toilet if that gives you any idea of the size. When I moved out of my home 4 years ago, we pretty much tossed stuff in boxes and hoped for the best. I wasn’t in the best of shape then. The other box was almost that large and I have found several boxes of old photos as well. Have you ever started looking at photos and been able to stop? I spent a whole week going through, sorting a bit and tossing a lot of duplicates. 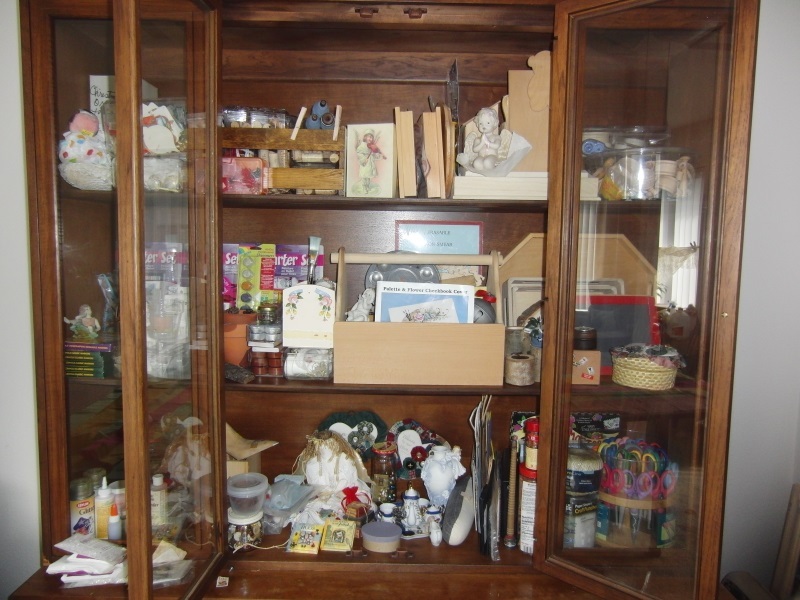 No more tea cups for this cabinet. Still hunting paints and glue gun. Have glue!!! With all the joining I have done to make friends in my new home, I’ve overloaded myself a bit with classes and projects. I’ll have some photos of the finished work shortly. Little by little, I’m starting to find how much I can do and what needs to be eased off from. Setting limits is something new for me. 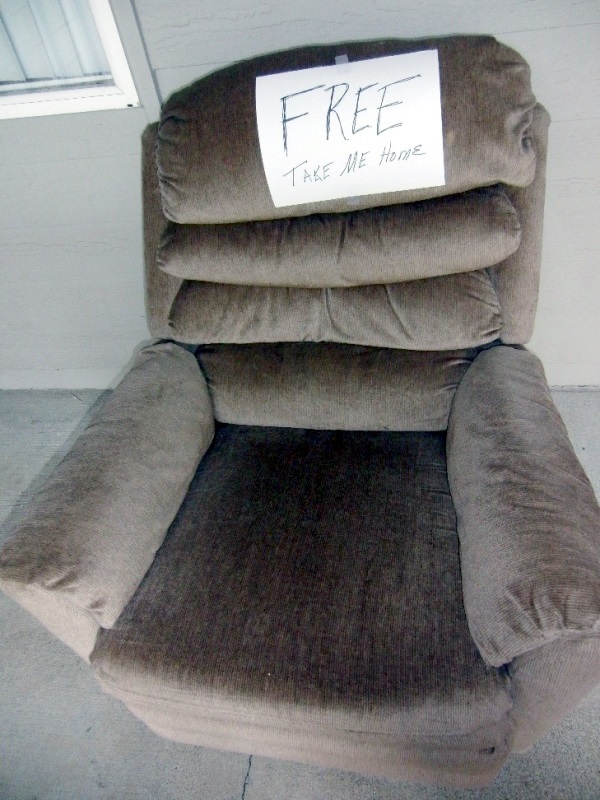 This replaced the recliner in my bedroom. Put it together myself but took a few adjustments. Still WIP here. But the kind of balance I’m talking about here has more to do with my Bells Palsy than my creative endeavors. Since acquiring health insurance this year, I have the opportunity to get some medical assistance for the balance. A new acquaintance at the quilting group let me know my HMO had vestibular integration therapy available. The first job was to get a different primary care doctor. The last one was quite dismissive. That done, I requested some therapy to get my eyes working together again which in turn, helps with my standing balance. If I’m in a dark room, I start to tip over and closing my eyes, well let’s just say that’s a dangerous move when standing. After a trip to a neurologist, (the third one in four years) I was allowed to get physical therapy for my balance. I have exercises to do twice a day. Some are standing holding onto my kitchen counter for support. (I don’t have a chair) The rest are sitting and turning my head and looking up and to the side that is unaffected. I’ve found I must do these when I don’t have to drive anywhere. Oddly, they add to the dizziness but I’m going to do whatever I can to get well. Even after four years, I am noticing movement in some parts of my face that was flaccid and I can almost make a complete smile. Still a bit odd-looking but hey, I’m happy with any improvement. 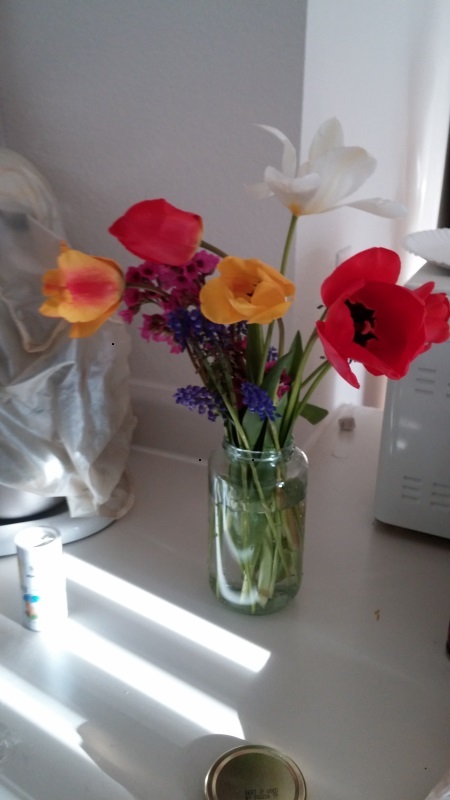 Flowers from my new friends garden. Made me feel better immediately. Funny how much I took for granted before Bells hit like a hammer. Unfortunately, healing of any nature still requires lots of rest. I’m not a fan. Moving and doing have been how I lived in the world, now I rest a whole darn bunch. Hang in there with me a bit longer. We shall see how effective these exercises are. Have you ever taken your health for granted and wound up with a major wakeup call? Do you believe your health is connected to your emotions and what’s going on in life or just something that happens?